most precious person that ever lived .Thank You for being you. I was so excited for her when she woke me this morning .I thought she had that new grandbaby .She was that excited.I could believe my ears you really did suprise me .I never dreamed what you were doing. Well it was worth the wait Dooley, you are an absolute star! We are so fortunate to have you, DR and Chance on the Stew. It amazes me when people reach out with kind gestures like this especially when it is someone they have not met in person. Have you got room in your garden? I'm moving to Arizona! Dooley - that is just precious. I had to bring it up in my photo program so I could get a good look. You are truly amazing. Love the turtle in the corner. What a wonderful surprise! That is a great quilt Dooley. How many different baby blankets have you made over the years? Both my boys still have theirs although Mike's is getting a little ragged. Oh Dooley, that is just adorable. I can tell a lot of love went into the making of that quilt. It is sure to be a family heirloom. 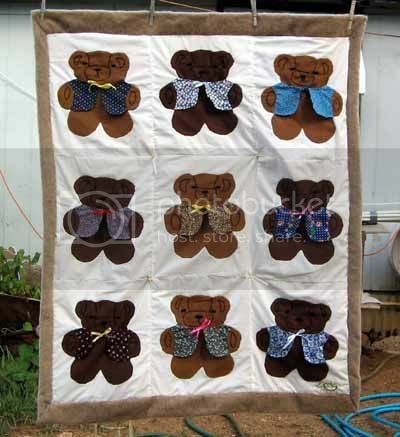 When we moved to our permanent residence my girls handmade baby quilts got lost, I was and still am heartbroken.